I totally agree with Terry, I also bought one just to see what they were like and was not impressed. I have bought three trucks by Ruby Toys, I have met the proprietor of Ruby Toys, John Hope and he is intentionally doing models which were not done by Dinky. Two Dinky and two Ruby are shown below. Dave--I remember you showing these some time ago, and I was impressed then. They do look Dinkyesque and also appear to be nicely made. Are they diecast, and do they have a fair number to select from? Thanks again for showing them.....very nice! Terry - they are diecast and compared to Dinky feel heavier. They have four in their range, I have three of them. In each of the four ranges there are a number of different colour schemes. Unlike Atlas they do compliment the Dinky items. 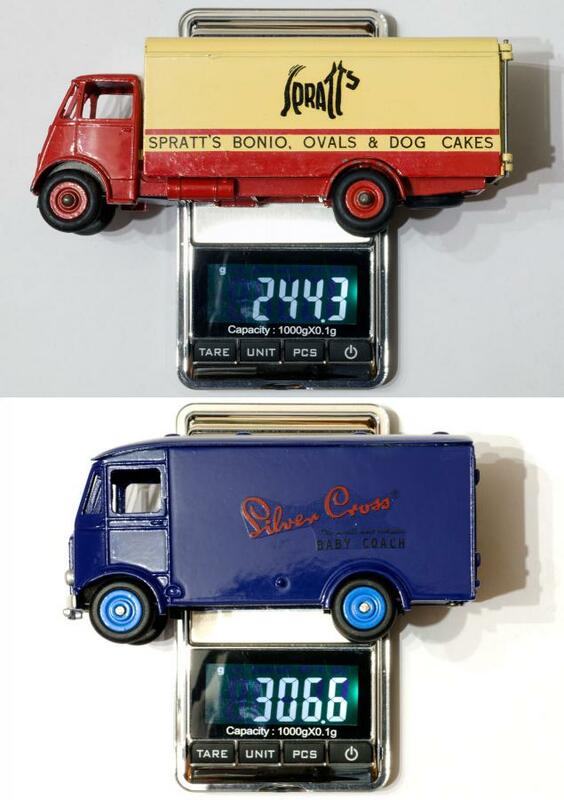 Terry - I have just put a Dinky Guy van and a Ruby Toys Albion van on the scales and this confirms my earlier thoughts. Wow, that is impressive, and it sure must then feel very sturdy and hefty in your hands.....very solidly built for sure! So that information about the large dinky model offering proved to be incorrect. Extracting basic facts from Atlas is probably made more difficult given that they don't seem to know what they are doing themselves most of the time. The large model subscription is now 20 into its run with the most recent delivery being a Bedford Coal Lorry. A new line of detail models was announced with an Aston Martin a few weeks ago. Meanwhile the original offering that began with the Morris Mini Traveller seems to have wrapped with most subscribers receiving a white Renault Floride as the closing model. Now Atlas has not notified me that the subscription is over, so I'm just guessing since nothing has arrived for a while. Some subscribers received Dodge, Porsche, Ford Vedette, Simca Versailles, etc, and other people got different models. The total appears to be around 48-50 versus the 80+ in the original French offering. The french atlas website has a facility to buy models right off the page whereas the uk website hasn't pulled it together so anyone in the UK looking for fills will have to go to the secondary market. Yes. I posted something on this but it’s under the Dinky Citroen SM thread.